The last few weeks have been a killer for my hobbies. While I’ve still been able to get in games of Warmachine, and play D&D on Tuesdays, I’ve done almost nothing else during any free time except play Fallout 4. Xerxis 2 languishes on my desk, 30% painted, My desk itself is covered in the refuse of a score of different projects. I don’t regret it one bit. Remember: Game Spoilers ahead, though I will try and avoid story. Not at all, even through some strange bugs, some untimely deaths and some frustrating battles, I’ve enjoyed almost every bit of it. Even the settlement building, which I originally thought would be terrible, instead, is not. I’ve built Sanctuary up to be a respectable settlement, with an Armory, a Power Armor Vault, Water Filtration, a Kitchen and a Barracks. I’ve also started building a Great Wall around the town, to prevent any raiders from attacking the main entrance to town. The Settlement aspect took a while to grow on me, but it now strongly colors how I play the game. Early on I was simply focused on survival and caps. I knew that I would be pressed for ammo, money, and stimpacks, but this is a problem I’ve pretty much surpassed at this point. I’ve over a hundred stimpacks, almost 10,000 caps, and though I run out of 10mm ammo fairly often, I’ve been able to quickly restock. With those vitals under control, selling every valuable weapon or piece of armor I came across quickly lost it luster. I started hording, because RPG’s, the cool things I’d found. Then, the revelation came: I could trade with not only the named personnel at my settlements, but everyone. Every single person could be armed, armored, and given berets and Sunglasses. I can be The General of my own private army, and I could fend off raiders and build giant fortresses. I quickly emptied out my personal stash, equipping every person I could with a set of Road Leathers and full leather armor, or Military Fatigues and Combat Armor. Originally, the Combat Armor was saved for the Important people, but as my conquests grow, I’m able to outfit more and more of my army with the equipment they need. Every settler in every location is armed with some of the best guns I find, powerful weapons and helpful armor to ward of the worst of the wastelands marauders. I am my own army, and I will conquer the Commonwealth. When I mention that it colors my game, though, I didn’t mean in the the changes that I’ve undergone above. Instead, loot changes its flavor entirely. Before, I was completely content to upgrade my armor and never look at another Combat Armor Left Leg again unless it has some awesome special ability. Now, I pick it all up. 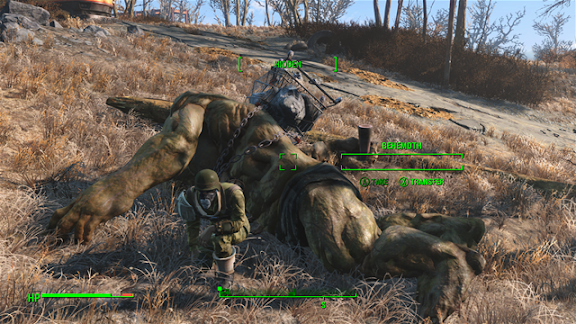 Chest pieces, legs, arms all come with me because I need my army, my followers, to be able to be well defended against the depredations of the wasteland. This, above all others, now pushes me forward. I am not constantly looking for better equipment. It is a very different game than I started out playing. Its hard to be a General without splitting a few skulls, and I’ve built a very strong suite of abilities that enable me to really stretch the bounds when it comes to the acceptable killing power in this game. I’ve taken a few perks that really stack together to make the build come alive, but what has really enabled it to shine is the modification system for the weapons. Early on I knew I was going to be a Gunslinger, so I grabbed the first gun I found and started modifying it to make it into the best weapon I could find. I swiftly realized that the chest was the best hit percentage, and with a huge clip of bullets and a great per-shot vats consumption I was able to bank on that percentage to carry my through over sheer damage. What I left behind me were bullet riddled corpses, and a pretty huge pile of them. Perks didn’t do a whole lot for me in that regard. What I needed to do was build the right gun to match the perks I had been taking. I moved up from a Standard magazine to a large magazine, and then to a large, quick eject magazine. Everything I did with the gun improved its damage and its magazine capacity, which in turn magnified all of the perks I was putting into the gun, creating a synergistic whole that is amplified beyond what I could have expected. Now, I wander the wasteland without fear, striding into raider camps, only to jump into vats and take out three or more in a single go, thanks to Gun Fu and Critical Banker, two of the best perks in the build (I think I’ll do a deeper dive into that next week). My gunslinger build is as much fun as I’d hoped it would be, and pretty effective, if I do say so myself. One Behemoth, nothin’ but 10mm. It wouldn’t be fallout without some sort of RPG element, and though the settlements are a good, solid RPG foundations, the real soul comes from the character you create. I detailed a little bit about him in the first post, but let me shed some light on the character I’ve created in my head. The Sole Survivor, Liam, is haunted by the past. The events that transpired that lead him to this wasteland, this time, have scarred him deeper than the in the military ever could. He is stern, brooking no arguments, and settles disagreements with violent finality. He is uncouth, uncultured and greedy, desiring wealth so that he may build an arsenal with which to crush his enemies. Even through all the trouble and violence, though, he has a kind streak, feeling compassion for the innocent and the maltreated. I feel he embodies the angel of vengeance, striking down those who have done wrong without a thought. He won’t argue, convince or try and save those who have fallen. They made their choice, they will reap its reward. He expects, soon, to perish as well, a victim of the choices he has made. Right now, though, he’s quick on the draw, with the devils own luck and an eye for a bad situation, and its enough to keep him alive through many, many situations.